CeRDI, together with Professor Britt Klein, Director of the Centre for Biopsychosocial and eHealth Research and Innovation, FedUni, has been engaged to develop a web-based education package for the Dementia Care in Hospitals Program, a national program aimed at improving the experience of patients with cognitive impairment in acute hospital settings. The Dementia Care in Hospitals Program (DCHP), led by Associate Professor Mark Yates (Ballarat Health Services and Deakin University), was first introduced in Ballarat Health Services in 2003. 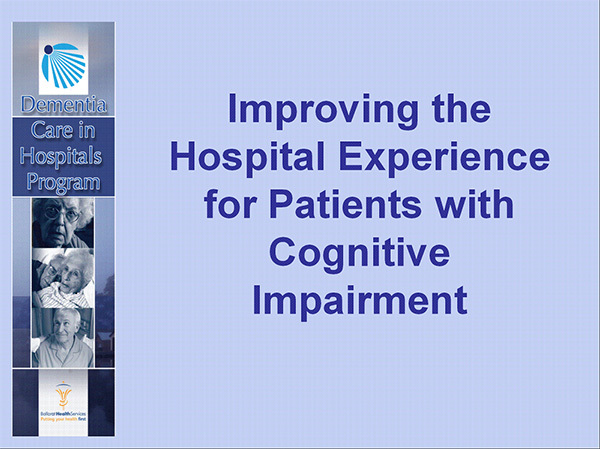 The aim of the program is to improve the experience of patients with cognitive impairment in hospital acute settings. Here cognitive impairment is defined as the range of thinking and memory difficulties which may affect a person’s ability to understand and communicate and can limit a person’s ability to respond to their environment. Cognitively impaired patients generally are at higher risk of experiencing adverse hospital acquired complications including urinary tract infection, pressure injury, pneumonia and delirium. It has been recognised as necessary to screen and identify patients with cognitive impairment, for hospitals to change practice in the way care is given to these patients and for hospital staff to improve their awareness of, and communication with, patients with cognitive impairment. A key element in bringing about practice change in hospitals is education. The DCHP National Project has developed all-of-hospital education resources – for clinical staff e.g. nurses and doctors, and for non-clinical staff including food-service, cleaning and other ancillary staff – to improve the communication and support provided by all hospital staff in the care of patients with cognitive impairment. The DCHP has now been introduced in 29 hospitals in Victoria, Australian Capital Territory, Tasmania, South Australia and Western Australia. One of the deliverables under the current DCHP National Project is to develop an electronic education program to support the DCHP in bringing about practice change for all staff in acute hospital settings. CeRDI in collaboration with Professor Britt Klein, Director of the Centre for Biopsychosocial and eHealth Research and Innovation, FedUni has been engaged to develop the web-based education package using content provided by the DCHP team. Two web-based education programs have been developed, for clinical and non-clinical staff. These include Powerpoint type slide presentation, personal anecdote video and appropriate Multiple Choice Questions to confirm understanding. The site was developed using the education software, Moodle. This enabled the presentation of video and static slides, Multiple Choice Questions, and monitoring and recording participation and progress. Reduce the rate of hospital-acquired complications. The role of the FedUni team will be to develop the online portal which will enable access to a care-bundle and a suite of education and service change programs to assist health services to provide quality cognitive impairment care. The portal will also provide access to benchmarking data and visualisation and analysis tools to assist the researchers and health services track their progress in implementation of the program and with improvement, using measures related to cognitive impairment care. 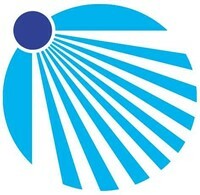 Ballarat Health Services is a comprehensive public health provider in the Ballarat and Grampians region. It has been at the forefront of Dementia Care, and the Dementia Care in Hospitals Program (DCHP) was first introduced in Ballarat Health Services in 2003. Deakin University is a leading Victorian university, ranked in the top 2% of universities globally. Dementia is a research focus area, and it is a member of the Dementia Collaborative Research Centres.